But the Snow Queen doesn’t participate in general joy of the approaching New Year's holiday. She was tired of fun, children's laughter and gifts, she wants peace and quiet. The Queen decides to steal the magic flute. The snow will stop and everything will freeze. There will be "ice paradise". And when Ded Moroz will go on his magic sleigh to the children to wish them a Happy New Year and present gifts, the evil Snow Queen will dare to seize power in their hands. What will win – Good or Evil? 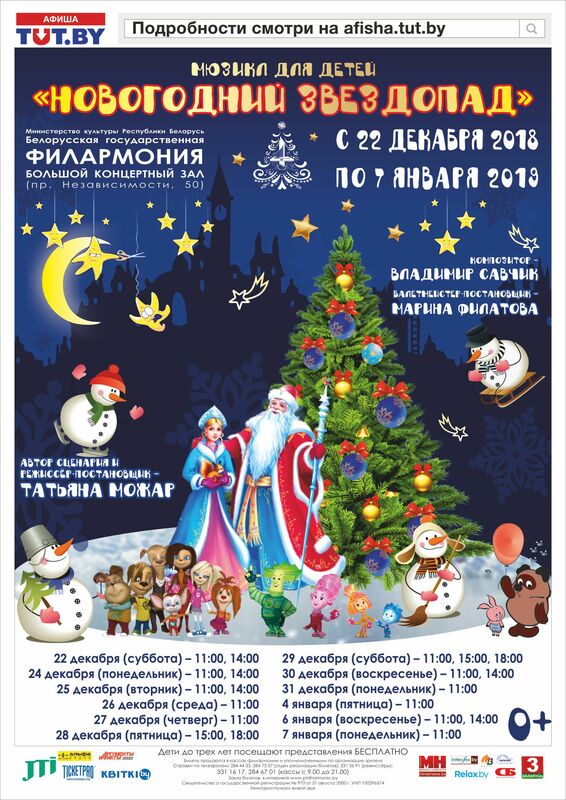 You will have an unforgettable meeting with the most beloved fairy-tale characters – Winnie-the-Pooh and Piglet, Minnie Mouse, joyful Ginger Puppy (the symbol of the departing year), Man of Iron and certainly with Ded Moroz and Snegurochka!